In his absence, Michael asked me to write a post about the phenomenon known as “Mini-Psalters.” I don’t really know what else to call them, and the prefix “mini-” implies all sorts of fun, kind of like mini-marshmallows or mini-golf. And indeed these Psalters are fun. They measure about 3.5 x 5 inches, with a depth of about 1 inch. They are the “fun size” candy bar of the world of psalmody and can easily be tucked away into a purse, backpack, or glove compartment. Publication history: Published in 1959, these little guys are complete reproductions (including confessions and liturgies in the back) of the Centennial Edition of the blue Psalter Hymnal of the CRC (which is identical in musical content to the commonly used 1976 edition). They feature the same classic “stained glass” logo on the cover with “Psalter Hymnal” written in gold Gothic script. 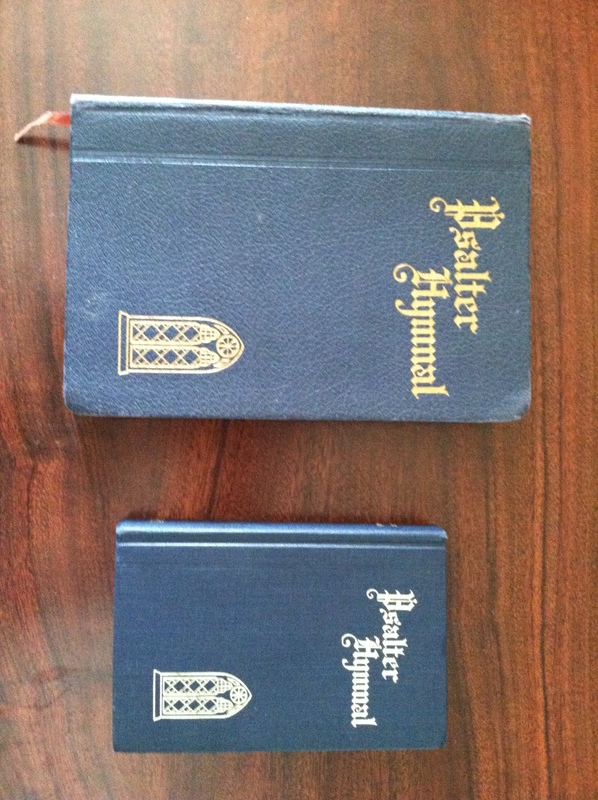 There also exist black “mini-” versions of the earlier 1934 Psalter Hymnal, as well as the 1987 gray Psalter Hymnal. I’m sure many other hymnals and Psalters come in “fun size” as well. For instance, in my daily worship, I always use the “mini-” version of The Book of Psalms for Worship of the RPCNA. Thoughts: The very existence of the “mini-Psalter” format points to a thriving tradition of singing in the church during the twentieth century. They wanted to sing the psalms and hymns. They wanted to carry around with them the worship of God they experienced on Sunday. A Psalter Hymnal was something that everybody wanted to carry around with them, a beloved and cherished book of the people of God. In my experience exhorting at various congregations in the URC, OPC, and RPCNA, one of the most uplifting comments I get is when someone will say that a psalm or hymn that we sang in church really spoke to them, and that he or she followed up on the service by meditating on the words of that psalm, praying through the words of that hymn, or just singing that psalm or hymn every day. Witnessing that act of carrying worship throughout the week is a special delight. Seeing people take the words of the Psalter and hymnal on their lips (and into their hearts) not just in church, but in their everyday lives, is such a boon. And that’s the spirit that I think the “mini-Psalters” capture – the heartfelt desire to carry the worship of God with you every day. These hymnals were meant to function as “tag-alongs,” to carry, like I said above, in your car, your purse, your backpack, etc. From experience, I can say that these hymnals are perfect for road trips, camping trips, airports, etc. “Mini-Psalters” are excellent tools for pastors. I know several pastors who keep one handy in their car or briefcase, ready for hospital visits, family visitation, or any emergency situation that might come up. In addition to a Bible, this is the item they’d never leave home without. The “mini-Psalter” provides a quick way to reference the confessions, the liturgies, and the beautiful prayer forms in the back. It also would enable the pastor to quote well-known psalms and hymns during his shepherding ministry. “Mini-Psalters” are also excellent tools for family worship (the importance of singing in family worship was briefly discussed when Michael interviewed me, and I’m sure it can be further discussed at a later date). Of course, this can be easily accomplished by normal-sized Psalters as well (but there is something overwhelmingly “adorable” about seeing a toddler carrying around an appropriately sized hymnal). I’ve seen several families cultivate a love for the Psalter Hymnal by having their young children bring their personal “mini-Psalter” to and from corporate worship every Sunday. In this way, the children see a connection between what they sing at home and what they sing in church. “Mini-Psalters” are a good way to “interlock” your private worship with the corporate worship on Sundays. It’s a declaration that these words, the words of the psalms and hymns of the people of God, are not just for Sunday, but belong to your everyday life as well. Additionally, using the same Psalter or hymnal during the week as you do in church on Sunday encourages a solidarity among the congregation. It develops a repertoire for worship, a common set of words, phrases, and stanzas with which to express our Christian community, our common experience of union with Christ. It gives us a tangible vocabulary with which we can join together our disparate (and desperate) personal stories into one great narrative of salvation. Can a “mini-Psalter” do all that? Not on its own, but it sure can help willing and excited hearts. 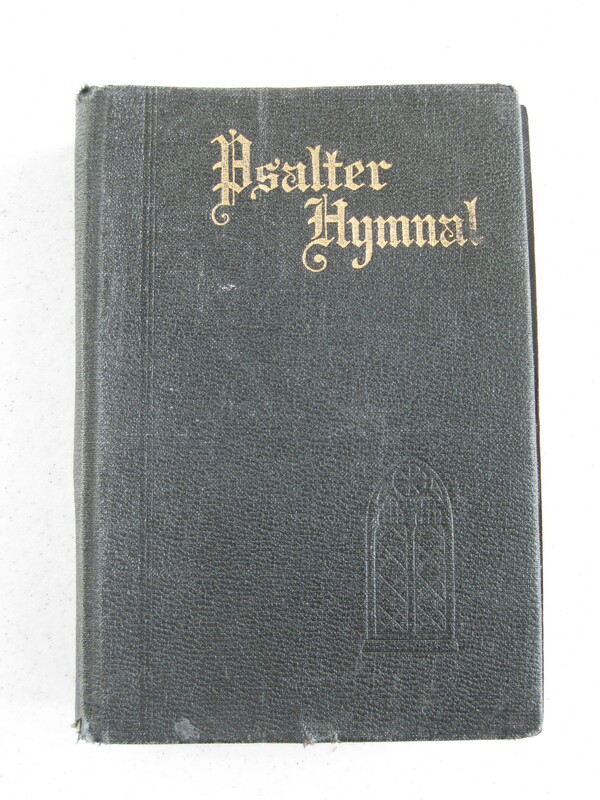 Do you own, or have you ever owned, a “mini-Psalter?” How do/did you use it? If mini forms of the blue Psalter Hymnal were republished, how much interest do you think there would be? Would you order some? How would you use them? When the new URC/OPC collaboration hymnal comes out, should a mini version be made available? Would you use one? Why? Finally, is anyone aware of a secret supply of “mini-Psalters” for sale? I know that at Mid-America Reformed Seminary, for instance, they’re always a hot commodity, and I’m sure there’s a thriving “black market” for them elsewhere in the URC as well. So if anyone has information, feel free to post about it in the comments below. I can usually find one or two tucked away in various Grand Rapids used bookstores, but if anyone is aware of other suppliers, let us know. The summer of 2012 will prove to be an exciting season of change for URC Psalmody. Maybe you’ve already noticed some modifications in the layout and content of the site. Or maybe you’ve discovered URC Psalmody’s new YouTube channel, where I’ve begun uploading a variety of Psalter Hymnal selections. But the most exciting news I’d like to announce to you today is that I’ve been joined by a new contributor here on URC Psalmody. I’d like you all to meet James Oord. 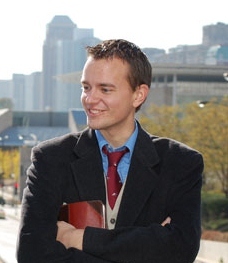 James is a graduate of Grove City College and a student at Mid-America Reformed Seminary. I first met him online—through this blog’s Contact Me form, of all places. Jim shared with me his deep and growing appreciation of the psalms, his like-mindedness with regard to Reformed worship, and his great love for the church. Needless to say, we hit it off excellently. Just a few weeks ago, by providential coincidence, I learned that Jim would be visiting our church here in West Sayville to preach. Over the weekend we had some great conversations, but it wasn’t until our two-hour session of piano-organ duets improvised from Psalter Hymnal tunes that I started to realize the possibility of a musical partnership of sorts. Having Jim join the blog as an author was simply a logical step, and I look forward as much as you do to reading his contributions on URC Psalmody. My heartfelt thanks to Jim for his willingness to join us here on the blog. Since I’ll be attending a TASC (Teens All Serving Christ) mission trip, he’ll be “holding the fort” at URC Psalmody next week–and after that, Lord willing, we’ll both continue to write new posts! Thanks be to our providential God for bringing about this friendship, and may he enable us to continue glorifying him through the psalms and songs of the church. I’ve uploaded four more videos of the singing at Synod 2012. The first two songs, “Praise Jehovah, All Ye Nations” and “Not What My Hands Have Done,” were chosen by delegates on the spur of the moment Tuesday morning. While the ballots for synodical officers were being counted, chairman pro tem. Rev. Kuiken directed a quick song service. “We have some time to kill. Could I have a number?” These two songs were the first selections. More videos will be coming soon! During the week of synod, the URCNA’s most significant decisions were easy to spot, but the specifics could sometimes be hard to pin down. Today, in retrospect, I’d like to review the decisions of Synod 2012 regarding each of the topics we’ve considered over the past few weeks. Delegated to address Overtures #8 and #9 as well as the Psalter Hymnal Committee report, Advisory Committee 9 made three recommendations to synod. That Synod direct the Psalter Hymnal Committee to consider ways by which there may be the least amount of unrest and concern preceding and subsequent to the implementation of a new song book with respect to these three matters: (items 1-3 in Overture #8 without lists of songs). Two grounds were included (items 4 and 5 from the grounds of Overture #8). That this be Synod’s answer to Overture #8. That this as well as our previous report in connection with the Psalter Hymnal Committee’s Report be Synod’s answer to Overture #9. The advisory committee’s report came before synod late at night, when many of the delegates were simply too weary for a detailed examination of the subject. Without much debate, all three recommendations were passed. The next morning, however, the delegates were fully awake. It was as if synod suddenly asked, “What did we just approve?” Concerns were raised that the recommendation didn’t actually address many of the concerns of Overture #9; that neither Overture #8 nor Overture #9 contained the background sections required by synodical procedure; and that some of the allegations in the first recommendation were fundamentally false. As a result, after a more thorough discussion, synod rescinded some of its decisions. The final determination: The concerns expressed in Overture #8 were referred to the Songbook Committee, while Overture #9 was rejected as irrelevant (given the joint project with the OPC). After some discussion, the chairman eventually ruled that Appeal #1 was out of order, as it should have been submitted as an overture instead. Unfortunately, there will not be any closure on Living Water’s concerns until at least next synod. However, I sensed no significant opposition to the content of the appeal—which may be a promising sign for its advocates. The Proposed Joint Church Order was received for information and further feedback to the committee. No specific action was taken with regard to Article 36 on worship music. Synod asked the committee to recommend a financial plan to Synod 2014 regarding the publication of a songbook. It also encouraged the churches of the URCNA to contribute to the Psalter Hymnal Fund. But their most important decision was to approve the Songbook Committee’s second recommendation: “That synod accept the invitation from the Orthodox Presbyterian Church’s Seventy-eighth General Assembly ‘to work together to produce a Psalter-Hymnal for use in a wide range of confessional Presbyterian and Reformed Churches’…” This is cause for great rejoicing! Nothing related to church music popped up during synod’s treatment of CECCA. More videos of the delegates’ singing will continue to appear here on URC Psalmody over the next few weeks, but our discussions on Synod 2012 have drawn to a close. In some ways it seems a shame—I certainly had fun in Nyack last week, and I thoroughly enjoyed reporting all of it back to you. Not to worry though; I’ll keep the Synod 2012 information page open with links to each of these articles. And by God’s grace, URC Psalmody will continue; soon, in fact, I hope to be sharing with you some exciting new developments. So keep reading!